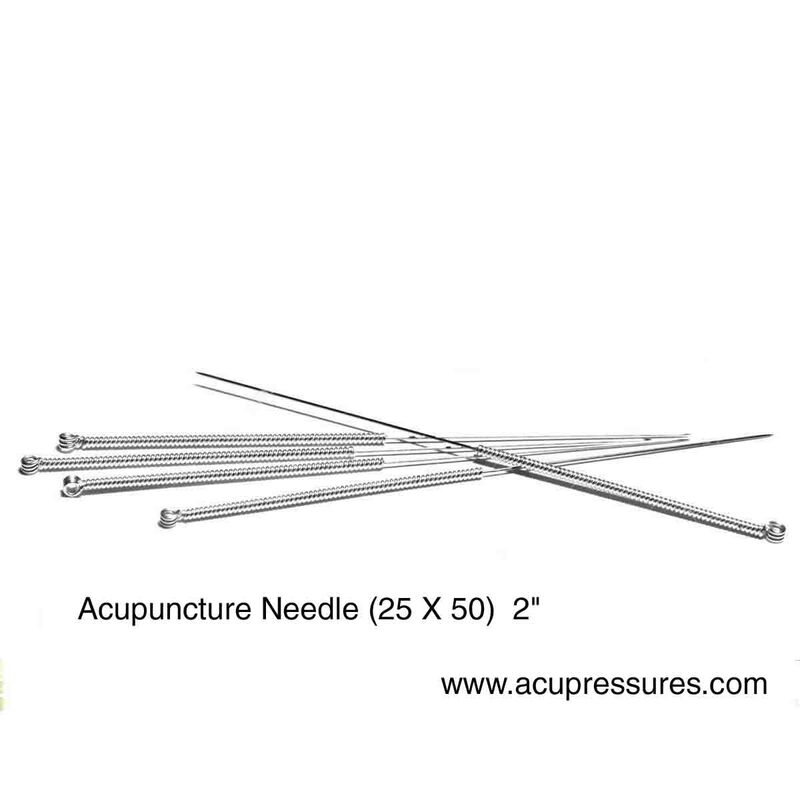 Acupuncture Neddle (25X50) 2 (100pc) Sterile Acupuncture Needles for single use Needles with tube contains 100 needles in Box . size is 25x50 =( 2"). The most common mechanism of stimulation of acupuncture points employs penetration of the skin by thin metal needles, which are manipulated manually or the needle may be further stimulated by electrical stimulation (electroacupuncture). Acupuncture needles are typically made of stainless steel, making them flexible and preventing them from rusting or breaking. Needles are usually disposed of after each use to prevent contamination. Reusable needles when used should be sterilized between applications.Needles vary in length between 13 to 130 millimetres (0.51 to 5.12 in), with shorter needles used near the face and eyes, and longer needles in areas with thicker tissues; needle diameters vary from 0.16 mm (0.006 in) to 0.46 mm (0.018 in) with thicker needles used on more robust patients. Thinner needles may be flexible and require tubes for insertion. The tip of the needle should not be made too sharp to prevent breakage, although blunt needles cause more pain. एक्यूपंक्चर नीडल (25X50 )बॉक्स 2''(100pc)का प्रयोग सिंगल उपयोग के लिए किया जाता है इस बॉक्स के अंदर 100 नीडल के पीस आते है !इस नीडल का प्रयोग चेहरे पर ,आँख के ऊपरी भाग आस -पास जाता है ! शरीर के किसी छोटे से भाग पर यदि दर्द हो तो इस नीडल का प्रयोग किया जाता है !यह नीडल अलग अलग साइज के अंदर मिलती है इसके अंतर्गत यदि किसी नीडल का पैकिंग खुला हो तो उसका उपयोग हमें नहीं करना चहिये ! इस नीडल को लगाने के लिए इनसेरटेर का उपयोग किया जाता है ! इस नीडल के माध्यम में से ज्यादा गहराई वाला दर्द भी कम हो जाता है इसको इलेक्ट्रिकल स्टिमुलेटर की सहायता से भी उपयोग में लिया जा सकता है ! इस नीडल को स्टेनलेस स्टील से बनाया गया है !